- FrancesCassandra: UK fashion, beauty and lifestyle blog. : My Onesie Confessions with F&F. In the colder months, there's nothing I love more than cosy nights in front of the fire wearing a onesie, and I'll be the first to admit that I am accumulating quite a collection of the comfy one-piece garments. So when F&F got in touch with me asking if they could send me a hamper full of treats for a perfect night in, I wasn't going to turn it down! 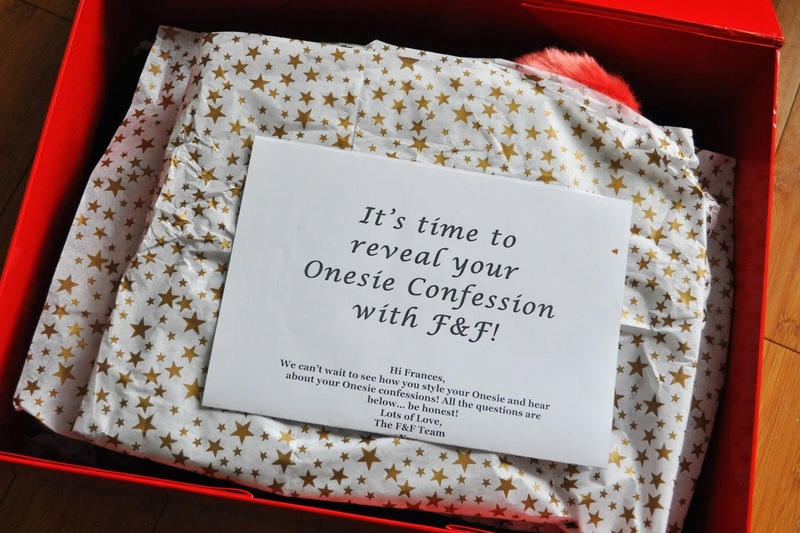 However, this came with a little catch- F&F challenged me to reveal my onesie confessions which left me feeling a little nervous, but I was relieved to see that they were just a few fun onesie-related questions! So donning my new scotty dog onesie and fuzzy slippers, I sat down with my laptop to confess my onesie secrets! 1. Tell us your favourite bits about your new F&F Onesie or/and a previous one you have owned! I love the colours and the cute dog print on my new F&F onesie, and it isn't too thick which means I'll be able to get use out of it next Spring as well when it starts getting a little warmer. I do own a couple of really thick, fleecy onesies as well which I practically live in when it's super cold! 2. It’s time to confess… where is the funniest place you’ve caught someone (or yourself!) wearing a Onesie? And will you be venturing out of the house in your new F&F Onesie? I'm not brave enough to wear a Onesie outdoors- I even cringe a little when I have to answer the door to the post man, haha! I saw somebody wearing a Onesie at the cinema once- it was quite odd but I can definitely see how it could be appealing! 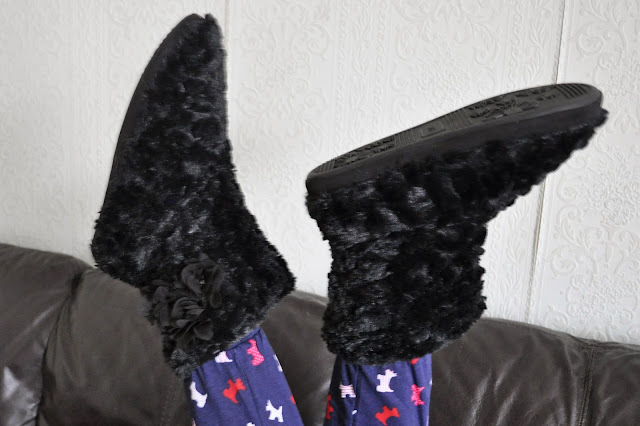 Fleecy, fur-lined and animal-themed! I love those funny novelty onesies that have a hood with ears and a tail haha- I adore this one from F&F- How cute?! 4. This Christmas, if you were to gift a Onesie to anyone, who would you choose? 5.Now you own a Onesie, will you be encouraging your friends and family to get one too? I always encourage EVERYBODY to get a onesie! 6. What makes your perfect night in? And those are my onesie confessions! F&F have a huge range of onesies to choose from for guys and girls of all ages, so I suggest you take a peek at what they have to offer here if you don't already own one! I also want to know what your onesie confessions are, so leave me a comment telling me what your favourite onesie is and if you have ever worn it out in public! *DISCLOSURE: This post contains PR samples. Ahh you got the new Bridget Jones! Lucky! :) What awesome goodies! Aww the scotty dogs are so cute! :) I have a Hello Kitty onesie and I love it! Aw it looks so cute!